Well, we made it, 28 days in a row for this thing and will finish with my favorite picture of the bunch, always brings a smile. Just a couple fishin’ fools, all dressed up with somewhere to go. From the looks of these guys, the fish don’t stand a chance. This one comes from July 23, 2012 which was birthday #45 for me. Dad told me he would take me anywhere for my birthday, a meal, a movie, Bass Pro Shops, Vegas, whatever. He’s retired, had a free day, so up to me. I chose the creek (remember, that rhymes with stick, right). Okay, so that’s not really how it went down but the July 23 birthday thing is true. 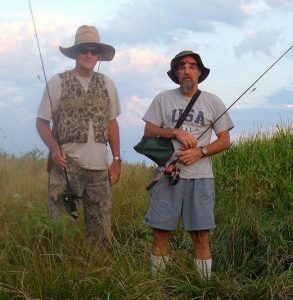 And for a lot of years, he and I have gotten together to chase some fish on or around that date. This time we chose a spot we call “Pat’s Creek” and armed with a couple containers of dew worms we were ready for whatever swims there. That’s the fun of wading the creek as you never know what will pull on the end of your line. 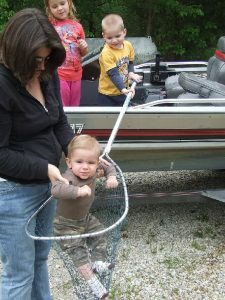 Today’s picture and the additional samples serve to convey family fishing at its finest. 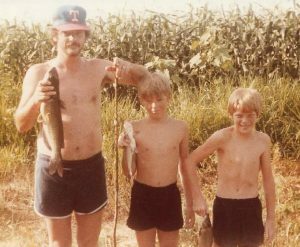 A rod and reel (or some bankpoles), some livebait, whatever old clothes you don’t care about, a pair of “creek shoes” and getting right after the fish right where they live. Really don’t get much more basic than that and here’s how I summed up the July 23, 2012 trip in an excerpt from the original fishing report posted on July 24, 2012. So, with the picture of these two goofballs, I’ll call it a wrap on the month long “Blog Banner” series. Today’s picture was one of those instances that just deserved to be preserved and I am grateful that a camera has been a steady companion over the years. I must say that the addition of a written memory to accompany the pictures has also provided quite a treat upon developing this writing habit back in 2002. Sure hope some fellow outdoor enthusiasts can find some common ground when they get a chance to stop by. Did I ever tell you about a place called Emiquon? Why, of course, I did. In fact, a couple other Blog Banner pictures have featured fish and data from the interesting and productive fishing hole. 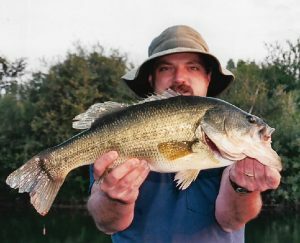 I’ve got nothing firsthand to report from the last several years but reliable sources indicate that there’s still plenty of bass down there. Just a little tougher to find and fool. 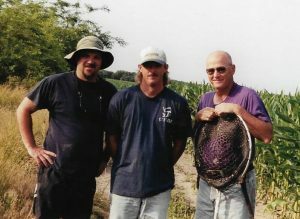 Back in the days when I visited Emiquon (2009-2013) it produced an amazing combination of quantity and quality. 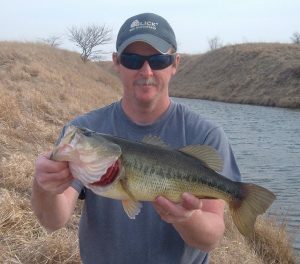 The bass featured today was landed in July 2012 and came on a day when I had to work for the quantity aspect although a 23 bass day on most public waters is pretty solid in my book. 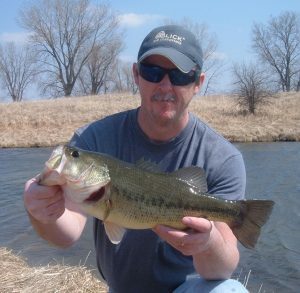 Quality, however, never faltered on any of my outings down there and this day was no exception as 22 of the 23 bass measured 13” or better. That’s a 96% “keeper” rate with my definition of “keeper” being 12” or better (only a categorical label as all are released). Folks, that’s just crazy and the lone “short” fish came in at 11”. But today’s featured fish was something else altogether. The picture does a good job of accentuating it’s build but in person it truly looked freakish, in a good way. 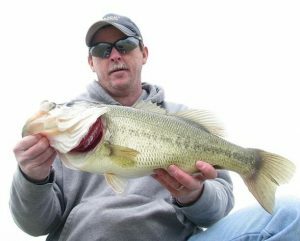 This catch only measured 18” in length but tipped the scales at a whopping 4-11. 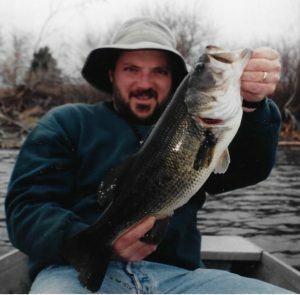 By comparison, the weights of all other 18” bass in my database (37 bass) range from 2-3 to 3-8 with an average weight of 2-13, nearly two pounds lighter than this beast. 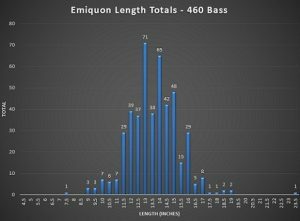 The dozen bass in the database whose weights range from 4-9 to 4-13 measure from 20” to 22” (see comparison below). In addition, the fish below was the runner-up on the day at 2-8. And it measured 17.5” in length. Yep, only a half inch shorter but over two pounds lighter. A solid fish in its own right but not even close, just plain weird. So weird, in fact, that this is the only fish that I have ever caught that was given a nickname, hence the title of this posting referring to “The Pig.” Here’s an excerpt from the original fishing report that I submitted back on July 17, 2012 that describes the origin of the nickname. 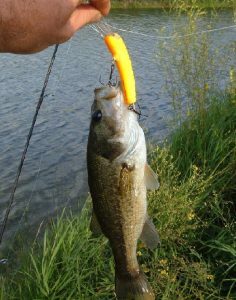 Figured that the Blog Banner needed to include a fishing lure and tough to beat the classic black and blue jig and pig. In fact, it was included in a 10-part series that I posted back in February 2012 at a previous blogging gig. 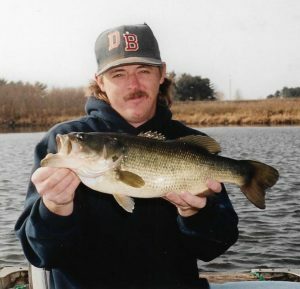 That series was entitled “Legendary Lures” and featured ten lures that had left a lasting impression over nearly 30 years of chasing fish up to that point. 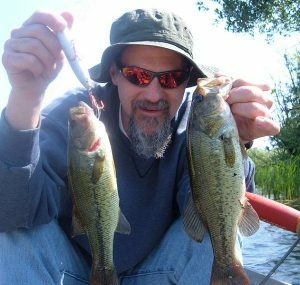 For any angler, those lures and baits are the tools of the trade whether filling a photo album or a frying pan and the options just keep on growing. 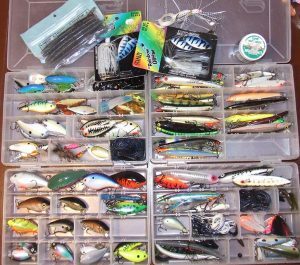 As has my tackle collection over the years via updating or expanding on old favorites or being unable to resist the urge to join the club when the latest “can’t miss” baits hit the market. Boy, I could go on and on about lures. So, whether or not I qualify as a fishing writer, I no doubt have the chops when it comes to being a fisherman. I can ramble with the best of them. 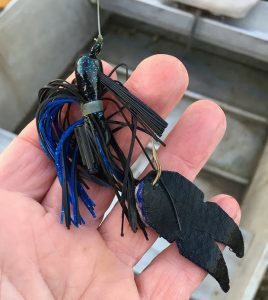 And before I end this one, how about a few pics to reinforce my selection of the black and blue jig and pig as the Blog Banner representative for those favorite tools that call our tackleboxes home. Okay, so I’ve only got four more Blog Banner pictures to cover. And if you are keeping score at home, you already know that it is exclusively a fishing finish. Almost like I planned it that way as Mother Nature typically produces some open water around here for us folks who don’t get too gung ho on the hard water fishing. 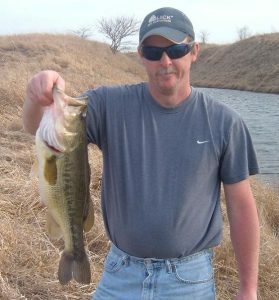 Today’s pic features one of a pair of four-pounders reeled in back in April of 2014 on some West Central Illinois walk-in strip mine ground while fishing with my brother, Brent. 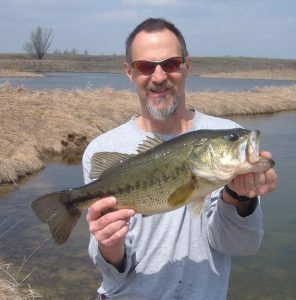 It was an incredible day as noted by the following stats, pics and Top Bass details, originally reported on the Heartland Outdoors website on April 16, 2014 (see link). Tough to describe, indeed, but I’m going to try anyway after a look at the rest of our Top 5 on the day. So, this spot featured very clear water and a steep drop into the main trough of the lake beginning just a couple yards out from my position on the bank. 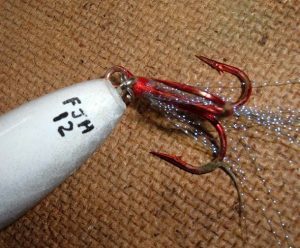 As my jig barely came into view when slowly hopped from the depths, a dark (and large) shape appeared a few feet behind the lure. Cue several nerve racking seconds when it seemed that time slowed down. 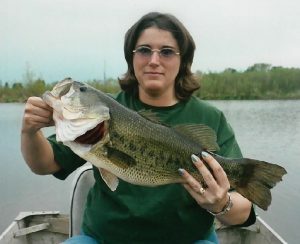 While the bass was interested, it had yet to commit and if I could see it, it could see me as well. Therefore, I had to be as still as possible yet impart just the right action to the stationary lure lying on the bottom within a foot of the fish. 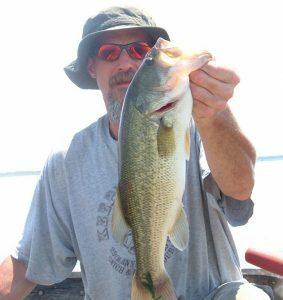 With the slightest lift of the rod tip the jig scooted along the slope with the skirt momentarily flaring out and the pig trailer giving a slight wave to my target. 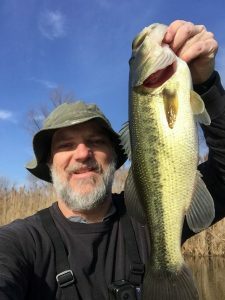 Slowly, the bass went nose down and looked to take the lure but I was leery to jump the gun on a hookset for fear of pulling the bait away and blowing my chance. I shifted my focus from the fish to the spot where the line entered the surface and saw it begin to move slightly to the left meaning that it was go time. 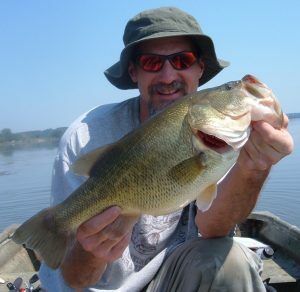 A firm hookset met with solid resistance indicating that I had played my cards right and all those years of practice had paid off for this veteran, unshakeable angler. 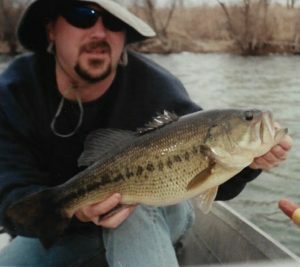 Had to include a shot of some of my stomping grounds in the Blog Banner as strip mine fishing has provided many good memories over the years. And a lot of miles on terrain that isn’t near as friendly looking from the ground as it is from the sky. Looks like you can just hop right from one body of water to the next if the fish aren’t biting. Well, lakes that appear to be a couple casts away can wind up being a substantial walk. That whole closest distance between two points is a straight line adage looks good on paper but strip mine reality is a different ballgame. But hey, that’s part of the fun right? And on the positive side, it keeps the pressure down. Only a fool would venture to some of those remote spots. Yep, a treat to find no other footprints and some uneducated bass. You also know you are in the right place when you don’t see any trash. Always marveled at those who can haul in full sodas or beers yet can’t haul the weightless empties back out. What’s also fun about remote collections of fishing holes is the fact that they don’t have a name. At least until I fool a bass in one of them. At that point I’ve got to log the catch which means I get to come up with my own and I will readily admit that this fishing fool is easily amused by himself. 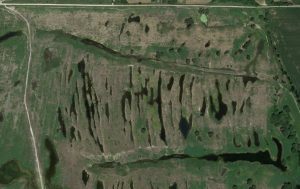 Today’s photo only shows a portion of this overall location and some of the fishing holes here and the adjacent ground bear the following names. Maiden Lake – first stop I ever made on the area. Well, depends on the day, I guess, and who says it has to be one of your kids. Just kidding, of course, it’s a four-way tie for first place. 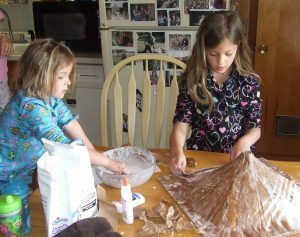 Today’s Blog Banner pic features kid number four to round out the crew. 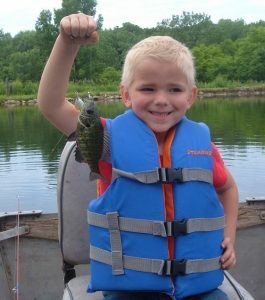 This is our youngest boy, Zac, during his turn in the boat on a 2016 camping and fishing trip. And his catch is what I am referencing in the title of today’s posting. 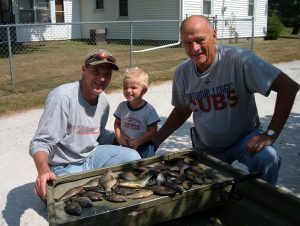 Yep, the good old, reliable bluegill is a dad’s best friend. 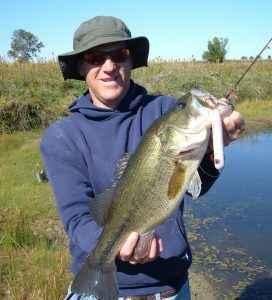 Typically quite cooperative and a solid battle for anglers of Zac’s size with their circular runs and occasional dives at boatside putting a good bend in an ultralight rig. Setting up the kids with a slip bobber, a 1/16oz jighead tipped with a waxworm and perhaps a split shot to get the bobber upright does the trick. 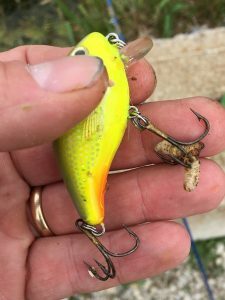 For my money, the slip bobber is the key to better and safer casting as opposed to several dangling feet of line flapping in the wind and looking to hook something besides a fish. 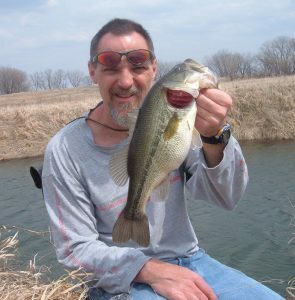 I also vote for a spinning setup over a spincast rig once the kids can manage the technique as they are much friendlier with such a slip bobber approach as well. But, as with most kids Zac’s age (and some grown up kids too) the fishing trip is about more than fishing. Why just last year he spent a fair amount of time trying to destroy my needlenose pliers by digging holes in the lane next to our fishing hole. Also ran through a fair amount of our waxworms by seeing how many he could impale on the trebles of a crankbait. 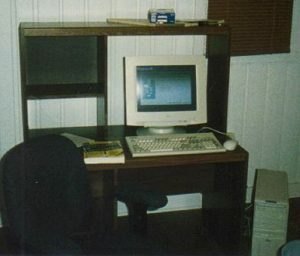 Broke down and got me a computer back in January of 1997. Crazy to think that is over 20 years ago now. Between being quite frugal and thinking why in the world would I need a computer, I was a hold out. And now, here we are in 2018 and everybody in my house has some kind of device. Once I unpacked that first system from multiple shipping boxes (big tower and big monitor) and got her up and running, a major project was putting some software to work in tracking my fishing results. 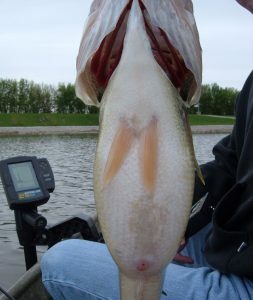 What you see in today’s Blog Banner photo is a result of some of that goofing around, the abnormal length distribution of a sample of the 460 bass I landed at Emiquon. Of course, lots of factors come into play for these catches but the bottom line is that place just wasn’t right in those first several years. Oh, but that only scratches the surface of the ways that everyday home and mobile technology has enhanced my enjoyment of this fishing hobby. 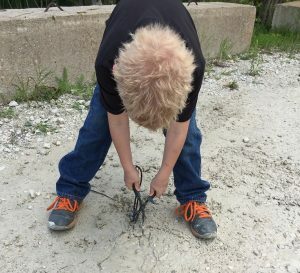 So here’s some good outdoor reasons to embrace The Computer Age from a guy whose childhood pre-dates home computers, cell phones and the internet. 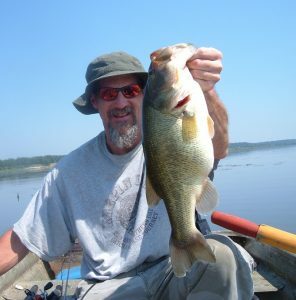 Bassmaster tourney results in real time not in next month’s magazine issue. 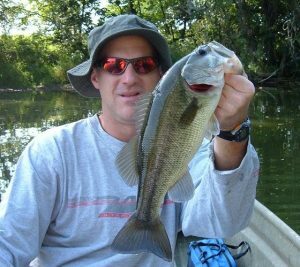 Myriad fishing reports, although most not very good, secrecy still rules, I get it. A plethora of fishing videos but think I’m getting too old for some of these crazy youngsters, I was born too early and have a tamer vocabulary I guess. But hey, I can even make my own fishing videos, pretty fun but need some more practice and try to be less of a dork as I used “shoot”, “son of a gun” and “dangit” (3 times) in a matter of 9 seconds upon losing a November bass at boatside. Satellite images of my fishing holes, 2D walk-in terrain looks better than the real deal. We get do overs on fish pics with instant feedback on cameras and devices. Can order fishing stuff from anywhere, anytime, kind of dangerous. 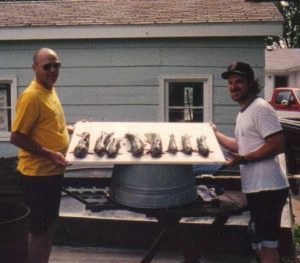 Can turn my display into the old baitshop counter stacked with Polaroids via a simple search such as “Emiquon Bass” (you should try that one, preview below). I can share fish stories with other anglers in my living room and I’m the only one there. I can send a pic of my latest catch to Mom (she shows Dad), Julie or my brother while sitting in an eight foot johnboat in the middle of nowhere, that’s cool. And they’ll give anybody a blog these days whether he knows what he’s talking about or not. On the heels of yesterday’s posting about an unexpected fringe benefit of blogging, here comes another one. Funny how it worked out like that. 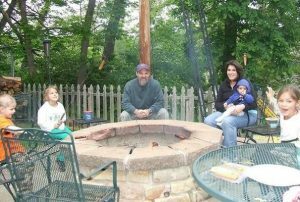 Today’s blog banner photo of me and our youngest, Zac, comes from 2012 at a place called “The Doghouse” during a weekend family getaway. 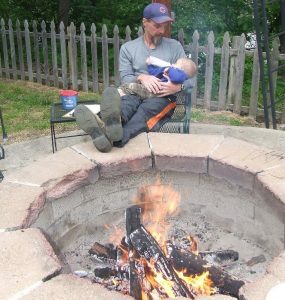 Doesn’t get much better than sitting around a campfire with the family and getting kind of tough to remember what it was like when kids were this small. 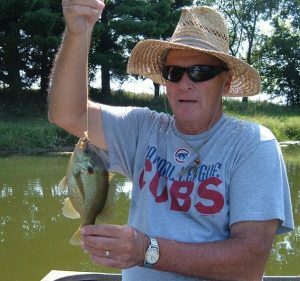 At that time I was hooked up with another blogging gig and I had mentioned a desire to check out Jim Edgar Panther Creek State Fish & Wildlife Area in Cass County, IL. A fellow who occasionally commented on my blog entries reached out to offer up his family’s cabin, known as “The Doghouse”, located just a short drive from the park. 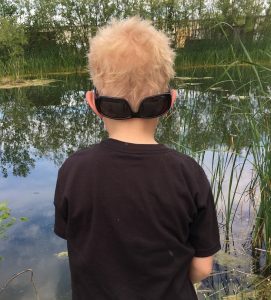 We took him up on the offer and would make several visits over the next couple years, using the spot as base camp for trips to Jim Edgar, Springfield and The Emiquon Preserve. A very generous offer that was greatly appreciated by me and Julie as our standard version of weekend trips involve a tent instead of a cabin. And with the little guy in tow that would mean two tents and a pack and play. Done it more than a few times but when offered alternate accommodations, well, we were all in. I started writing fish stories on a whim close to sixteen years ago and this submission brings my “career” total to 1,166 postings. That’s a lot of words and pictures, and a lot of time. Especially considering it’s not a paying gig beyond a $50 check I received once upon a time for my contributions at another website. 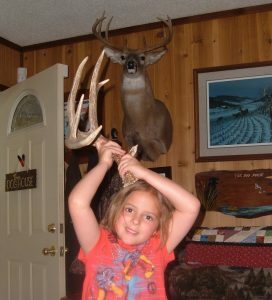 But I knew that going in and I’m good with that, just like to write about enjoying the outdoors with family and friends. 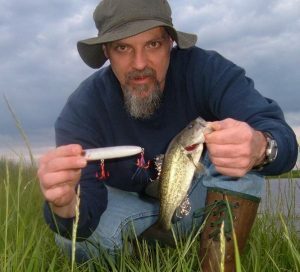 What I did not foresee were several instances of a bonus sort of windfall, one of which is hanging from the lip of the bass in today’s blog banner photo. 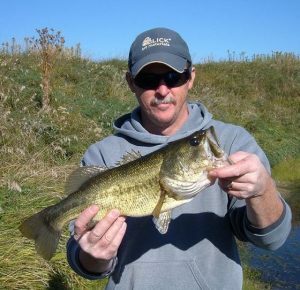 This bass came from some Knox County, IL public walk-in strip mine ground in September 2013 on a homemade topwater bait. 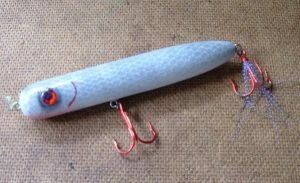 The bait, called the K9 Walker, was fashioned by a fellow from East Central Illinois who followed my blog on another website. 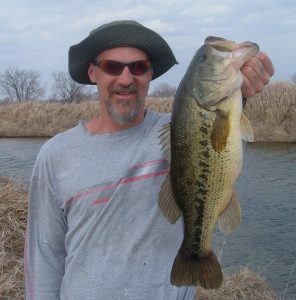 A cool gift that I initially put to use in the spring of 2013 fooling several bass as pictured below. 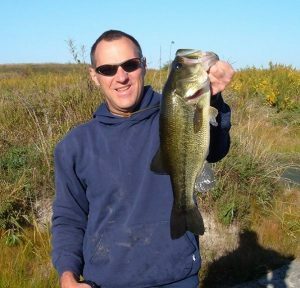 The September fish that is the subject of today’s blog banner pic was the second of a pair of four-pound fish that I caught on the outing from a then nameless remote pothole in the span of fifteen minutes. Since the designation of “K9 Lake” had already been assigned as noted in one of the above pictures, I took to calling this spot “2×4 Lake” in honor of the four-pound pair (the first four-pound bass fell to a Smithwick Suspending Rogue jerkbait). 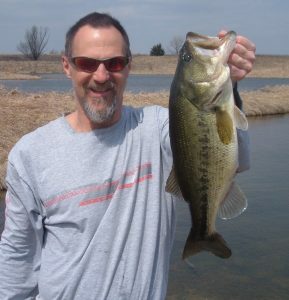 One other note on today’s pic is the fact that the pothole cranked out another four-pounder in 2014 on a jig and pig. However, it will continue to be referred to as 2×4 Lake in honor of the fish story resulting from the second big bite of that September day courtesy of the K9 Walker (thanks, Frank, if you’re out there reading). Fancy boats, gaudy lures and exotic destinations beckon from the magazines, catalogs and websites of the major players in the fishing industry. Some pretty cool stuff, no doubt, enough to break the bank if you so choose. Yep, our hobby gets as intense and expensive as one wishes to make it. And that’s what is part of the fun in this picture. 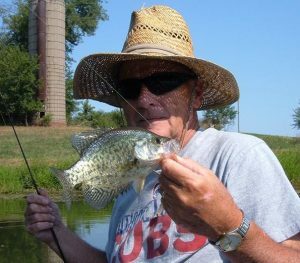 A 2013 father-son outing on a farm pond in a borrowed johnboat to chase some panfish on waxworms hung from a bobber or twister tails on a jighead, perhaps adding a spinner if you want to get real high-tech. Basic stuff, a throwback to the days when things were much simpler with fewer choices and less temptations to empty the piggybank. And here’s a little secret…that old, basic, inexpensive route is still just as fun and still gets the job done. 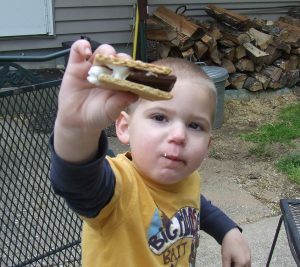 Another cool aspect is the inclusion of my youngest boy, Zac, the third generation in this picture. While he did not accompany us on this outing, his smile says that he thinks it’s a pretty cool scene. You see, with a dose of imagination and a tinge of photoshopping to add a black and white filter, this shot could have been taken in 1970 instead of 2013. And that kid in the middle would be yours truly flanked by his Dad and his Papa instead. Not much of a stretch really.